The Law Offices of Nathaniel F. Hansford, LLC is dedicated to giving your case the attention needed for maximum compensation. The Law Offices of Nathaniel F. Hansford, LLC is dedicated to advocating for injured workers. If you have been hurt on the job due to a catastrophic accident, do not hesitate to reach out to our Atlanta workers’ compensation lawyers. We handle cases across Georgia and Alabama, boasting a track record of million-dollar case results. Our legal team understands how dangerous the work environment can be, which is why we are here to represent you through this trying time. From difficulty getting back to work to challenges with covering medical bills, you may be anxious about what comes next following a workplace accident. The good news? Our Atlanta workers’ comp attorneys at the Law Offices of Nathaniel F. Hansford, LLC are here to guide you through the process and fight for the just outcome you deserve. Our firm is multi-lingual, offers free case evaluations, and remains easily accessible to our clients. 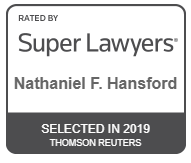 Our team at Nathaniel F. Hansford, LLC is dedicated to ensuring your case is handled in the best way possible. Call us, or fill out the form below to request your free consultation.